How do you tell a story about pairing food? “Oh, you should have been there, in my mouth, as the Abbaye de St. Bon Chien broke holes like caul fat through the stinkiest cheese, so stinky you could smell it in your eyes, and it melted together like the Steadfast Tin Soldier and his parchment girlfriend…” Right. I tried to incite a sense of game– a solitaire or personal challenge– by using a scoring method I gleaned from pairings at Oakshire a few years ago. A grid was laid out with rows of beer and columns of cheese; each beer had a chance to be paired with each cheese, and a score of -2 to +2 filled in the corresponding boxes. 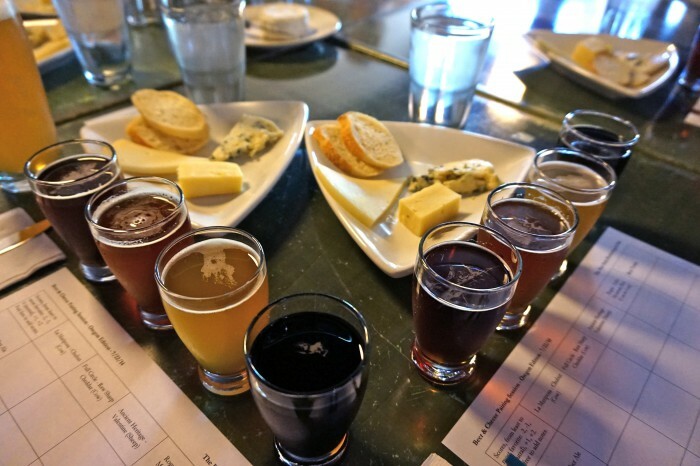 Three elements of learning at work: deep thought about each pairing to develop a score; the best individual pairings would be readily apparent; and the total scores from each cheese and each beer would illuminate the most adaptable beer and cheese. My success at getting the point across was in the B- range; the audience was 90% younger than I (20s), and largely inexperienced with pairing (obviously no fault of theirs; heck, I’m happy to have exposed them to the concept). I felt my job was to explain the intricacies of perception; how to taste food & beer at the same time, and how to look for resonance, contrast, and intensity levels in each item. Due to a spotty arrival rate, a 15 minute delay seemed to have made everybody hungry, so by the time I got started talking I felt rushed to get food in mouths. It was loud and hard to hear myself, so I moved it along, skimmed and stumbled over my bullet points, and didn’t get any real story in. But everybody talked, about this and that; most utilized their grids– some even made artwork of them– and seemed generally satisfied at the end. The most well-received cheeses were , naturally, the most expensive. Ancient Heritage’s Valentine was a personal favorite, with rich creaminess and subtle funk; it brought some cream to the coffee of Pelican’s Tsunami Stout. The Full Circle Raw Sharp Cheddar was perhaps best at backing up the beers– I only chose one (Oakshire Amber) without a particularly strong flavor or set of flavors; perhaps a predilection to assume that other folks don’t enjoy subtlety as much as I. In the meantime, I have discovered that Biere de Garde (at least my homebrewed version, which matches fairly well the flavors I recall from Tres Mont’s and Sans Culottes) goes well with a variety of cheeses, and so that style will make an appearance on a pairing list soon. Of course, “If at first you have nominal success, do better next time!” as my inner old man says. Next time I’ll tell you a true story.